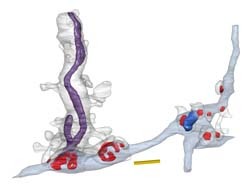 3D cytoarchitecture of putative electrical synapses on spiny dendrite in dentate gyrus. 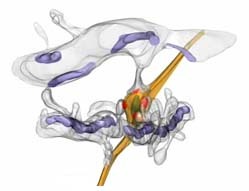 Gap junctions (GJ) form electrical synapses at dendritic shaft while at dendritic spines they represent mixed synapses located predominantly at large mushroom spines. Arrows denote 13 thin and 2 mushroom spines on short segment of reconstructed dendrite. Under semi-transparent surface PSDs are shown in red and GJs on the surface are green. Scale bar = 2 micrometers. 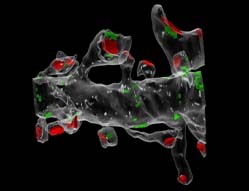 3D cytoarchitecture of synapse organization in dentate gyrus of the rat hippocampus. Branched mushroom spine with two heads synapsing on the same presynaptic axon. 3D organization of dendritic spines of CA1 hippocampal neurons. The example of multiple-synapse dendritic spine contacting with eight independent axonal boutons. Neurosci Behav Physiol. 2005 May; 35(4):333-41. 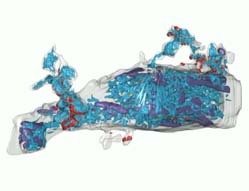 3D structure of the synapse in molecular layer in CA1 area of the hippocampus. An example of multiple-synapse bouton contacting with 4 spines originating from 3 dendritic branches. Zh Vyssh Nerv Deiat Im I P Pavlova. 2004 Jan-Feb; 54(1):120-9. 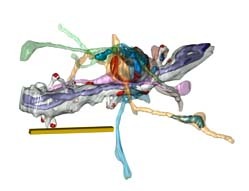 3D structure of proximal part of dendritic segment of CA3 pyramidal neuron of the rat hippocampus. Reconstructed segment and thorny excrescences share mitochondrial and endoplasmic reticulum. 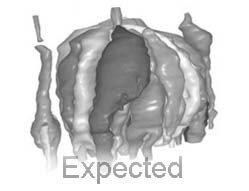 3D reconstruction of a taste bud from the foliate papilla. "On the left, a solitary bipolar cell with innervating nerve fibre is also visible." Annual reports. ICB RAS. 2001 December 17-18 . See also Nature. 2001, sep.13; v.413: pp.219-25. 3D reconstruction of the bacterial associate (Pseudomonas putida and Rhodococcus sp.). 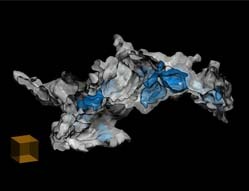 A simplified view of reconstracted fragment of bacterial associate presented at 3D illustrations page. Blue structures represent closed granules or "trophosomes". Scale - cube adge = 10 micrometers. FEMS Microbiology Letters. 2011 Feb;315(2):134-40.